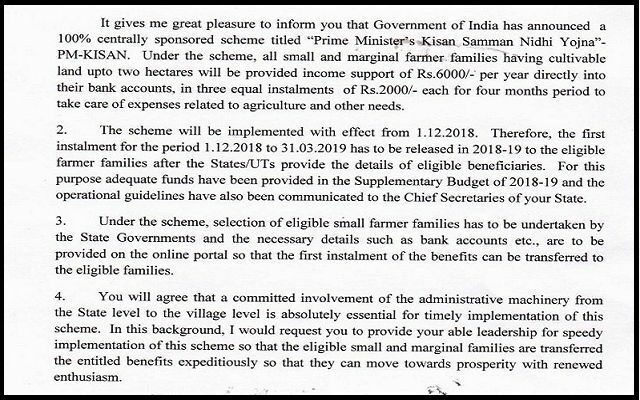 The Union Minister of Agriculture and Farmers’ Welfare, Radha Mohan Singh wrote to the Chief Ministers of all States for their support in the effective and speedy implementation of the PM-KISAN Yojana so that the entitled benefits are speedily transferred to the farmers. Considering that the declining prices of agricultural commodities and food inflation led to reduced returns for farmers, the Government felt the need for structured income support for farmers to procure seeds and labour. Taking this into account, the Government introduced Pradhan Mantri Kisan Samman Nidhi Yojana for farmers’ welfare.